Before we start this analysis I just want to point out a few things. I spent a lot of effort to reduce my exposure towards China about 1.5 year ago. And here I am, pitching another Hong Kong listed company. I’m aware of this, but I just can’t give up on a investment just because it’s listed in Hong Kong. The actual China exposure in terms of sales is actually rather modest. That being said, I will be careful to increase my exposure further and I have worked hard trying to find investments elsewhere. Right now Hong Kong is one of few equity markets that has seen a major sell-off and valuations are in some cases, like this, too good to pass on. My next point is on liquidity. This is again a fairly illiquid stock, buying or selling large blocks in this company will affect the stock price. As always do your own due diligence and don’t consider my posts investment advice. The last thing before we go ahead, I made a mistake regarding my stated position size in UR-Energy, it was supposed to be 3% not 2%. It was just an unfortunate typo in my previous post. + Low valuation (P/E ~7) growth company, 0.7bn Cash with a MCAP of 1.48bn HKD. + Dividend yield based on previous payout, north of 6%. + TCL main shareholder and incentive structure for staff in place (high stock/option ownership with management). + Track record of quickly shifting business into new products, high R&D spend. + Headphones and smart speakers growing rapidly on back of large respectable customers like Harman, JBL, Google, Alibaba etc. – US/China Trade War is a worry and will most likely create real impact. – As many Chinese OEM/ODM factories the reliance on a few companies is high, the largest customer (Harman) in 2017 stood for 42.8% of sales. Harman was acquired by Samsung in 2017, this puts some uncertainty towards the future relationship with Tonly. – Products shifting quickly, no guarantee today’s successful sales will last more than a few years. – Low margins showing low moat and high competition. – Although aligned management is a big positive, options programs have lately been too generous in my view. Tonly Electronics is a OEM/ODM manufacturer of home electronics. ODM (Original Design Manufacturer) is one step higher in the value chain, than pure assembly (OEM). This means that the company design and manufacture products which are later branded by another company for sale. Previously the products were mostly DVD/Bluray players, but that has changed over the last few years. Today the company mostly generates its revenue in the field of acoustics – speakers, soundbars, ear & headphones and smart audio devices. This transition is something we will look a little closer at, it is also a part of the reason why I decided to invest in Tonly. I have followed this company since it was introduced on the Hong Kong stock exchange. Back in 2013 I owned a Chinese LCD TV producer called TCL Multimedia (recently renamed to TCL Electronics). They decided to spin-off a smaller segment of their operations, which they named Tonly Electronics. Tonly produced DVD/BlueRay players, digital TV-boxes, speakers and soundbars. At the time I scratched my head somewhat what do with this holding. It so happened that all the ETFs/funds that held a position in TCL, just dumped their holdings as soon Tonly started trading. Probably because it was too small for their funds. This put significant pressure on the stock, which led me to my first case of bargain hunting among Hong Kong’s small caps. I liked what I saw an invested at cheap levels a few months after the spin-off. At first this went great, the company paid out a nice dividend, stock price recovered and then some. But then in 2015 things started to turn south. With rise of Netflix and other streaming services, DVD/BluRay player sales just fell of the cliff. 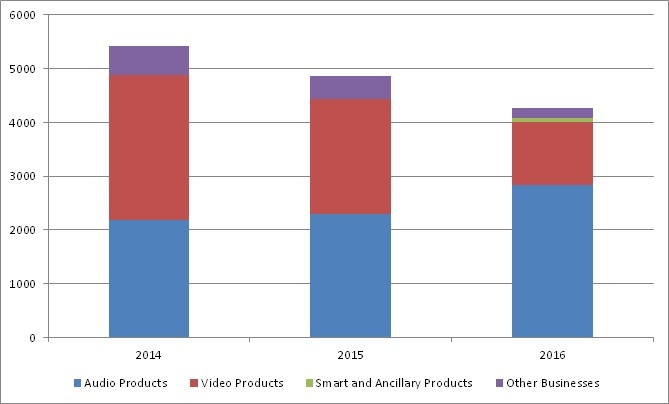 Although audio products kept growing steadily, 2015 ended with decreasing revenue and 2016 sales were down further. Although the company still managed to stay profitable, the stock market did not like what it was seeing. The stock lost some -50% from its 2015 highs, into 2016. Around the time I started this blog in 2016 I locked in some profits, but kept a small position (hence I did not take it up as a GSP holding). During earlier parts of 2017 I gave up on this holding, believing it was a lost cause, and allocated my money elsewhere. That was a mistake, I should have followed the company more closely and understood what could be seen already in 2016 figures. Something was cooking in the Audio Products segment. By second half 2017 revenue just exploded in the Audio Products segment. And this is where the investment case starts. 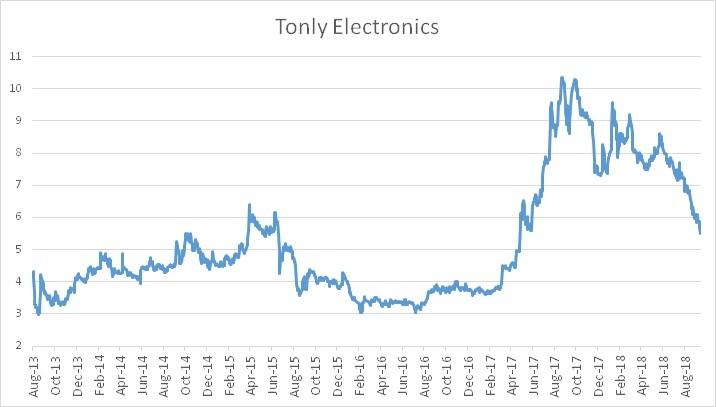 Tonly was facing major headwinds, nobody was interested in DVD & BluRay players anymore and this was the largest revenue driver of the company. Management redirected its around 500 engineers to increase its R&D efforts in audio products. Management built new relationships with Audio product brands. Within just a few years time, the company manages to grow that business so that total revenue sets new all time highs in 2017 second half. The old revenue driver “video products” is now almost non existent. Be it that the company caught some tailwinds within the audio space, but to me this is a proper turn-around. It shows quality of management as well a testament to the research team to be able to develop new products. If I could just have spotted that in the second half figures for 2016, but alas I did not. Cardano on Sell UR-Energy and All-time-high! Cardano on Cheetah Mobile (CMCM US) – Value or a trap?